Cooking outdoors on a summer’s day is one of life’s little pleasures. 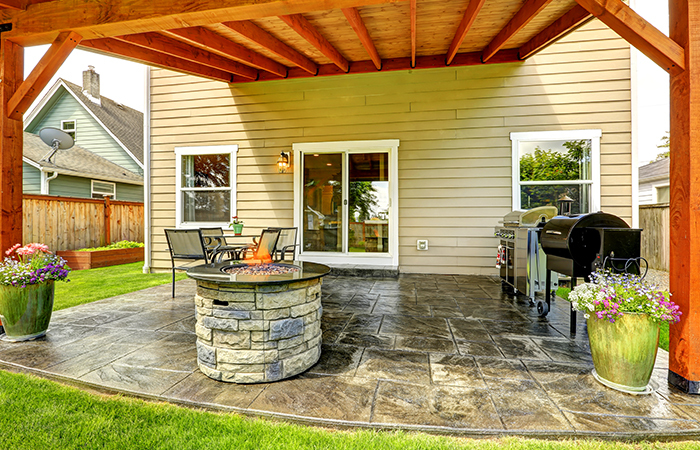 However, your harmless barbecuing activity can become a serious fire hazard if your outdoor fireplace or cooker doesn’t receive regular maintenance and cleaning. There are a few things you can do before and after you cook to reduce or even eliminate that risk. 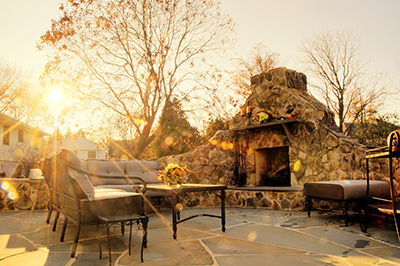 Low-angle view of a flagstone patio with an outdoor stone fireplace and furniture. Rays of sunlight stream down. When you use your outdoor fireplace, creosote, a flammable, tar-like substance, can accumulate in the chimney and flue. To reduce the risk of an uncontrolled chimney fire, remove any creosote buildup before you begin cooking. Though this is not an extremely common problem, it can pose very serious risks if not taken care of. Because removing the creosote deposits can be tricky, you should hire a professional to perform the maintenance. Clean up around the fireplace or cooker before lighting it. Dry leaves and brush can be a fire hazard since floating embers can easily start such debris on fire. Remove the debris and vacuum around the edges to prevent fires. Fireplaces, cookers, and accessories need to be cleaned routinely to reduce any fire hazards. Be sure to remove any ashes from the pit. Ashes can deteriorate the materials that make up your fireplace, and their buildup can reduce the safety of the enclosure of your fireplace or cooker. Instead of throwing away the ashes, use them elsewhere. They work as a very effective fertilizer, so you could put them on your grass or garden. They also work as an excellent de-icer for icy sidewalks and driveways in winter. To kill the flames from your fireplace, avoid using water unless in an emergency. Water will make a nasty paste out of the ashes. Instead, try smothering the fire with dirt, or, if possible, wait for the fire to go out. Never use an abrasive cleanser inside the fireplace or cooker. Many contain dangerous chemicals that will leave a flammable residue, not to mention an unfavorable flavor on your food. Instead, use a simple wire brush and some water to scrub away built-up food. While there are many things you can do to clean and maintain your fireplace, it is very important that you have your firebox, flue, and chimney inspected annually by a professional. When you need an inspection, cleaning, or maintenance performed, check out some Dallas area fireplace services.